For other uses, see USF. Not to be confused with Florida Southern College. USF is classified among "R1: Doctoral Universities – Very high research activity". In its 2011 ranking, the Intellectual Property Owners Association placed USF 10th among all universities worldwide in the number of US patents granted. The university has an annual budget of $1.5 billion and an annual economic impact of over $3.7 billion. In a ranking compiled by the National Science Foundation, USF ranks 43rd in the United States for total research spending among all universities, public and private. USF's first president, John S. Allen. USF was the first independent state university conceived, planned, and built during the 20th century. Former U.S. Representative Samuel Gibbons was instrumental in the school's creation when he was a state representative and is considered by many to be the "Father of USF." Although founded in 1956, the university was not officially named until the following year, and classes did not begin until 1960. The university was built off Fowler Avenue on the site of Henderson Air Field, a World War II airstrip. Before Henderson Field, the area was part of the 1920s 5,000-acre temple orange grove, the largest citrus grove in the world at the time, which gave the nearby City of Temple Terrace its name. In 1957, the Florida Cabinet approved the name "University of South Florida." At the time, USF was the southernmost university in the state university system. In 1962, the official USF mascot was unveiled as the "Golden Brahman." In the late 1980s, the mascot evolved into the "Bulls." The university grew under the leadership of John S. Allen, who served as its first president from 1956 until his retirement in 1971. During this time, the university expanded rapidly, due in part to the first master's degree programs commencing in 1964. Allen was known for his opposition to college sports in favor of an environment more academically-centered. Allen's ultimate legacy was to be the first person to build a modern state university from scratch: "As a completely new and separate institution, the University of South Florida became the first new institution of its kind to be conceived, planned and built in the United States in the 20th century." Today the John and Grace Allen Administration Building, named after the university's founding president and his wife, houses vital Tampa campus departments including Student Affairs, the Admissions Welcome Center, and the Controller's Office. In 1970, M. Cecil Mackey became the university's second president. During his time at USF, Mackey opened the university's medical school, School of Nursing, and first-ever Ph.D. program. Additionally, Mackey worked to strengthen the St. Petersburg campus, while opening new satellite campuses in Sarasota and Fort Myers. While serving as university president, Mackey continued to teach economics courses in a conference room across from his office. Mackey first coined a new descriptor for USF: "a metropolitan university." The term is still used to describe USF today. Moffitt Cancer Center on the USF campus. USF emerged as a major research institution during the 1980s under the leadership of the university's third president John Lott Brown. During his tenure, the USF Graduate School was established in 1980. In 1986, Brown oversaw the opening of the H. Lee Moffitt Cancer Center and Research Institute on the USF Tampa campus. USF became the first university in the nation to offer a Ph.D. in applied anthropology and the first in the State University System of Florida to offer a degree program in women's studies. In January 1988, USF Lakeland opened. On February 15, 1988, Francis T. Borkowski was inaugurated as the university's fourth president. He served as president for five years, laying the groundwork for the university's football program, establishing on-campus housing for the USF president at the Lifsey House, and merging several colleges into the College of Arts and Sciences. Betty Castor became the university's fifth president and first female president when she was inaugurated in January 1994. She served as USF president for six years until 1999. During this time, USF grew to be one of the largest universities in the nation in terms of enrollment. The Florida Board of Regents named USF a "Research 1" University in 1998. In 1997, the university began its inaugural season of NCAA football. Two years later, the Herd of Thunder marching band debuted. In 2006, Castor returned to USF to lead the Dr. Kiran C. Patel Center for Global Solutions. Castor stepped down from her position as director in 2009. On March 22nd, 2019, the USF Board of Trustees selected Dr. Steve Currall as USF's seventh president after a nationwide search through Greenwood/Asher & Associates, and confirmed by the Florida Board of Governors on March 28th, 2019. The University of South Florida System includes three member institutions: USF Tampa, USF St. Petersburg, and USF Sarasota-Manatee. Each institution is separately accredited, has a distinct mission, and its own strategic plans. The USF System once included two other satellite campuses, one in Fort Myers and the other in Lakeland. The Fort Myers campus opened in 1974 and closed in 2007, with the debut of Florida Gulf Coast University. The Lakeland campus opened in 1988 and split off from the USF System in 2012 to become the independent Florida Polytechnic University. The USF System is a member institution of the State University System of Florida (SUS), which is overseen by the Florida Board of Governors. Each SUS member institution, including USF, has a 13-member decision-making body called the Board of Trustees (BOT). The USF BOT appoints the USF System President, who in turn appoints the Regional Chancellors of the member institutions. The USF System is currently led by President and Chief Executive Officer Judy Genshaft, who was appointed by the USF Board of Trustees in 2000. In 2019, USF was classified as a "Preeminent" university by the state university system. For a public institution to achieve a status of preeminence, they must meet or surpass benchmarks in at least 11 of 12 metrics set forth by Florida lawmakers. Some of these metrics include, student quality, student success (freshman and graduation retention), faculty quality, post-doctoral support, research productivity, and endowment/private funding. When Florida lawmakers first introduced the 12 metrics that would be used in assessing if a university would be designated preeminent, USF only surpassed benchmarks for half of the metrics, earning them the designation "emerging preeminence." Changes in the higher education bill threatened to delay USF in attaining preeminent status for at least 3 more years, however, the bill was later vetoed by Governor Rick Scott. Starting with the 2018-2019 school year, the University of South Florida is designated as a preeminent research university, having met or surpassed benchmarks for 11 of the 12 metrics. The metric that USF did not meet the benchmark for was endowment, which for the University of South Florida, is currently $442 million - below the benchmark of $500 million, and trailing behind FSU with $639 million and UF at $1.6 billion. Overlooking the USF Tampa campus. Established in 1956, the USF Tampa campus serves more than 41,000 students. It is composed of the larger campus in Tampa, USF Health, and the College of Marine Science in St. Petersburg. The institution houses 14 colleges and is the doctoral granting campus of the USF System. The University of South Florida Office of Graduate Studies serves as the center of leadership for graduate education at the University of South Florida. 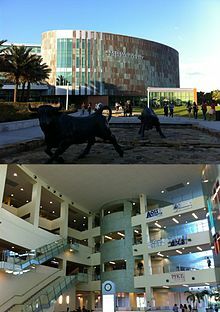 The USF Tampa Campus is also a tobacco and smoke-free campus as of 4 January 2016[update], referring to the campus as "Proudly Breathe-A-BULL!". USF first occupied the site of the USF St. Petersburg in 1965. In 2006, USFSP was accredited as a separate entity within the University of South Florida System by the Southern Association of Colleges and Schools starting with the 2006–07 academic year. USFSP serves approximately 4,500 students and offers 33 undergraduate and graduate programs in arts and sciences, business, and education. When USF Sarasota-Manatee was established in 1975, it originally shared a campus with the New College of Florida. New College and USFSM continued to share campuses until a new campus was built for USFSM in 2006. Nearly 2,000 students take classes at USFSM each year. The university offers 43 academic programs and certificates in arts and sciences, business, education, and hospitality and technology leadership. The USF Tampa campus offers more than 80 undergraduate majors and 130 graduate, specialist, and doctoral degree programs under 14 colleges. Based on a semester system, the USF academic calendar is composed of three academic semesters each year. The academic year begins in the fall, running from August to December. The spring semester generally begins in January and ends in late April or early May. The summer semester is broken down into three overlapping sessions – A, B, and C – that generally span either six or ten weeks. More than 41,000 students were enrolled at the USF Tampa campus in the 2014–15 academic year, including approximately 30,000 undergraduate students, 9,100 graduate students, 650 doctor of medicine students, and 2,000 non-degree seeking students. USF is one of the 40 most diverse universities in the nation, with students representing every state, U.S. territory, and more than 130 countries. International students represent approximately seven percent of the USF student population. As of the Fall 2014 semester, the student diversity profile of the university consisted of: 55 percent White, 12 percent African American, 21 percent Hispanic, 7 percent Asian/Pacific Islander, 0.16 percent American Indian, 4 percent two or more races, and 1 percent of students did not report. The Fall 2014 Freshman class of approximately 3,000 students earned admission to the university with an average SAT score of 1191 (reading and math only), ACT score of 27, and high school GPA of 4.00. 51 percent of the members of the incoming class graduated in the top 20 percent of their high school class. Among the incoming class were 8 National Merit Scholars, 7 National Achievement Scholars, and 6 National Hispanic Scholars. The Natural and Environmental Sciences building. The Honors College at the University of South Florida in Tampa, FL is one of fourteen colleges that offers programs for students. The Honors College was designed to support student success for academically advanced undergraduate students at USF. The students benefit from advanced, specialized courses that focus on discussion and debate, close interaction with faculty and staff, and research opportunities. As of Fall 2014, there are more than 1,700 instructional faculty at the USF Tampa campus. As of Fall 2013, the student to faculty ratio for the USF Tampa campus was 24:1. Approximately 86 percent of full-time faculty members hold terminal degrees in their field of expertise. Additionally, the university has more than 1,200 adjunct professors, 300 post-doctoral scholars, over 2,000 graduate assistants, and 2,800 student assistants. USF faculty continue to be recognized on the global academic stage with over 35 scholars receiving prominent scholarly awards since 2009, including Fulbright, National Science Foundation, AAAS, Guggenheim, and National Endowment for the Humanities fellowships. In 2012, a USF professor, Autar Kaw, was one of four in the nation to receive the prestigious Carnegie Foundation for the Advancement of Teaching and Council for Advancement and Support of Education 2012 U.S. Professor of the Year award. The first USF Commencement ceremony was held in 1963 where 325 degrees were conferred. In the 2014–2015 academic year, the USF Tampa campus awarded more than 11,400 degrees at the undergraduate, graduate, and doctoral levels. Commencement ceremonies are held three times a year at the end of the Fall, Spring, and Summer semesters. Spring ceremonies are generally the largest, with five separate ceremonies held each semester. Ceremonies for the USF Tampa campus are held in the USF Sun Dome. Additionally, the university livestreams each ceremony for out-of-town guests to watch online. The USF Tampa Library is the largest and most comprehensive library in the USF System. In addition to providing students access to more than 2 million academic journals, databases, and books, the seven story USF Tampa library offers tutoring and writing services, laptops, a career resource center, and Course Reserves and reservable group study rooms. The USF Tampa Library also houses several Special and Digital Collections, including literature, oral histories, photographs, artifacts, and the university archives. In 2012, the USF Tampa Library opened the Science, Math and Research Technology (SMART) Lab, a hands-on learning space which includes more than 300 computer work stations. In 2013, USF students successfully protested to keep the library open 24 hours a day/5 days a week during the Fall and Spring semesters for current students, faculty and staff who possess a valid USF ID card. In addition to the Tampa library, the USF System has two regional libraries and a medical library. The regional libraries include the Nelson Poynter Memorial Library, located on the USF St. Petersburg campus, and the Jane Bancroft Cook Library, located on the USF Sarasota-Manatee campus. The Shimberg Health Sciences Library serves the USF Health community and is located on the USF Tampa campus. USF is one of the fastest growing research universities in the nation, according to The Chronicle of Higher Education. In the 2010–2011 fiscal year, the university was awarded more than $400 million in research awards. The Intellectual Property Owners Association ranked USF among the top ten universities in the world granted U.S. utility patents in 2011. Center for Advanced Medical Learning and Simulation in Tampa. USF Health consists of the Morsani College of Medicine, College of Nursing, College of Pharmacy, College of Public Health, the School of Biomedical Sciences, the School of Physical Therapy and Rehabilitation Sciences, and the USF Physician's Group. USF Health researchers are breaking ground in the fields of diabetes, Alzheimer's disease, prosthetics, heart health, genomics, and more. In 2012, the College of Nursing ranked first in Florida for universities receiving research funding from the National Institutes of Health. More than 400 healthcare professionals at USF Health treat patients throughout the state of Florida. In 2012, the university opened the Center for Advanced Medical Learning and Simulation (CAMLS) in downtown Tampa. The 90,000 square foot facility serves as an education and training center for health professionals around the world. USF is one of a small number of universities nationwide given a gold rating by the Association for the Advancement of Sustainability in Higher Education for building an environmentally-conscious campus. In 2010, the USF School of Global Sustainability was created. In 2012, the new Patel College of Global Sustainability, consisting of the Dr. Kiran C. Patel Center for Global Solutions, the Master of the Arts in Global Sustainability program, and the Office of Sustainability, was introduced. Housed in the first Leadership in Energy and Environmental Design GOLD certified building on the USF Tampa campus, the college is a holistic academic unit that integrates sustainability research, scholarship, and teaching. USF signed the American College and University President's Climate Commitment (ACUPCC) in 2008 and submitted its Climate Action Plan in 2010 with a goal of a 10 percent reduction in carbon emissions by 2015. Since then, the university has introduced several sustainability initiatives, including electric vehicle charging stations, water bottle filling stations, reusable plastic food containers in dining halls, recycling programs in residence halls, a biodiesel-fueled fare-free campus bus service, solar-powered golf carts, and more. In 2011, the university introduced the Student Green Energy Fund, which allows students to propose and vote on projects that aim to reduce campus energy consumption, lower green house gas emissions, and promote sustainable technologies. Founded in 1988, The Center for Urban Transportation Research (CUTR) conducts over $13 million in research annually for a variety of public and private sector sponsors in Florida and the United States, including the Florida Legislature, the Florida Transportation Commission, and state and local governments, agencies, and organizations. Areas of research include public transportation, transportation planning, intelligent transportation systems (ITS), transportation demand management (TDM), transportation economics and finance, geographic information systems, access management, alternative fuels, and transportation safety, among others. Located next to the College of Engineering on the Tampa Campus, CUTR houses the National Center for Transit Research (NCTR), designated by the U.S. Congress in 1991, and reaffirmed in 1998, 2002, 2012 and 2013. The NCTR was selected as a Tier I University Transportation Center in 2012 in partnership with North Dakota State University, Florida International University, and the University of Illinois-Chicago and in 2013 in partnership with Florida International University, University of Illinois-Chicago, and the Texas A&M Transportation Institute. CUTR also houses the National Bus Rapid Transit Institute, sponsored by the Federal Transit Administration. Through NCTR and NBRTI, CUTR conducts research projects in rapidly growing urban areas to develop innovative, pragmatic approaches that will enable public transportation to better meet the evolving needs of U.S. citizens. In November 2013, CUTR launched the Automated Vehicle Institute @ CUTR, a multidisciplinary policy and planning program helping communities prepare for and implement automated vehicle technology. The USF Tampa campus provides multiple services and resources necessary for students to succeed both in the classroom and in their personal lives. Under the Division of Student Affairs, USF students have access to involvement opportunities, on-campus housing, dining facilities, recreational outlets, health and wellness services, and more. The original USF student union was built in 1959 and opened in 1960. Originally called the University Center, it was one of the first five buildings that made up the USF Tampa campus when it opened. In its early years, the University Center held the first on-campus women's residence hall, a cafeteria, post office, bookstore, game room, television room, and information desk. Classes were held in the basement and first floor of the building until other academic building were completed. The center underwent major renovations from 1988 to 1990. It was renamed the Phyllis P. Marshall Center in 1993, in honor of the woman who served as director of the building from 1976 to 1994. In order to better serve the growing student population on the Tampa campus, the building was torn down and replaced with a new 230,000 square foot union in 2008. The new facility, now called the Marshall Student Center, still pays homage to its former director. The four-story building features a 1,200 seat ballroom, 800 seat auditorium, 100 workstation computer lab, study and meeting spaces, several student lounge areas, and outdoor courtyards. The facility offers several retail outlets including a pharmacy, computer store, credit union, and identification card center. The building features nine dining options, including the first-ever Beef O'Brady's on a college campus. As the home of the USF Center for Leadership and Civic Engagement, Student Government, the Center for Student Involvement, the Office of Fraternity and Sorority Life, and the Office of Multicultural Affairs, the center is considered to be the gathering place for all things student life at USF. The Centre Gallery is a student-run art gallery located on the second floor of the Marshall Student Center with a focus on innovative, contemporary art work. The gallery is open to the general public. 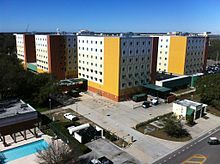 There are 34 residence halls on the USF Tampa campus, offering traditional, suite, and apartment style housing. In total, these residential halls provide housing to more than 5,600 students. The university also offers specialized housing options such as family housing, female-only housing, graduate student housing, and Greek Village. Each bedroom on the USF Tampa campus is furnished with a twin extra-long bed, dresser, desk and chair, trash can, and closet space for every resident. Each residence hall has at least one resident assistant. In 2009, the university implemented a new policy requiring all first-year, full-time undergraduate students to live on campus. The goal of the policy is to provide new students with a comprehensive educational experience. Students exempt from this new rule include those who remain living with their parents and/or legal guardians within Hillsborough, Pasco, and Pinellas counties, are above the age of 21 by the first day of fall classes, have a dependent child or family member, or are married. The university offers 12 Living Learning Communities (LLCs) in residence halls throughout the Tampa campus. The residential communities place special interest on academic majors or areas of interest, such as business, education, and sustainability. Residents are required to submit an application and meet certain eligibility criteria to be admitted into an LLC. In addition to on-campus housing, USF has formal relationships with five off-campus properties. Although the university has no ownership or management role in these entities, it recommends these alternative options on the basis of proximity to the USF Tampa campus and amount of USF students residing there. These properties include Campus Club, The Province, 40 Fifty Lofts, The Flats at 4200, and Avalon Heights. The Campus Recreation Center on the USF Tampa campus is a 21,000 square foot, WiFi-enabled fitness facility featuring a two-basketball court gymnasium, six group fitness rooms, an indoor suspended three-lane running track, 120 pieces of cardio equipment, six racquetball courts, and an indoor swimming pool. Inside the facility, members can workout, take group fitness classes, play intramural sports, rent equipment, receive personal training, undergo fitness assessments, and more. In addition to the Campus Recreation Center, there are other, smaller fitness facilities in the USF Tampa campus: The Fit in the Village complex, the WELL in USF Health, and the Magnolia Fitness Center within the Magnolia Apartments. Through Campus Recreation, the USF Tampa campus offers more than 30 intramural sports throughout the academic year. USF Campus Recreation also maintains the USF Riverfront Park, located two miles away from the Tampa campus. The recreational park is only open for use to USF students, faculty, and staff. Located on the Hillsborough River, the park boat house offers canoeing, kayaking, and paddle boarding. Groups can sign up to climb the 55-foot high ropes course located at the park, which features three levels of challenges. A less challenging version of the ropes course, called the low ropes workshop, allows teams to participate in trust building exercises and group problem solving. The Outdoor Recreation department of USF Campus Recreation hosts several recreational trips throughout the year. USF students, faculty, and staff can sign up to participate in guided backpacking, tubing, white water rafting, kayaking, and hiking trips both in Florida and throughout the Southeast United States. Outdoor Rec regularly hosts "beach days" during which the department provides transportation to and from nearby beaches including Fort De Soto Park, Clearwater Beach, and Honeymoon Island State Park. Additionally, the department hosts moonlight canoeing trips at USF Riverfront Park four times a semester. There are more than 600 registered student organizations at USF, including academic, professional, special interest, Greek, and multicultural groups. USF students are welcome to join existing organizations or apply to create their own. The USF Center for Student Involvement, located in the Marshall Student Center, provides multiple programs throughout the academic year, including the University Lecture Series, Homecoming Week, USF Week, and more. In addition to the Center for Student Involvement, the Center for Leadership and Civic Engagement offers numerous opportunities for organization involvement, personal and organizational leadership development, and community service. There are more than 40 fraternities and sororities recognized by the Office of Fraternity and Sorority Life on the USF Tampa campus. Four councils govern these chapters: the Interfraternity Council, the National Pan-Hellenic Council, the Panhellenic Association, and the Unified Greek Council. Greek Village, a residential area on the USF Tampa campus offers housing for members of 13 fraternities and sororities. USF C.W. Bill Young Hall. The USF Tampa campus offers three Reserve Officers' Training Corps (ROTC) programs: Air Force, Army, and Naval. USF is one of only 38 universities in the nation to offer all three service ROTC programs. The university was the first in the nation to create a Joint Military Leadership Center (JMLC) to house all three programs. Located in the C.W. Bill Young Hall, the JMLC is a 53,000 square foot state-of-the-art facility featuring a weapons simulation room, an outdoor rappelling wall, a joint cadet and midshipmen lounge, three lecture halls, and five classrooms. The building is equipped to handle web-casting, video conferencing, and distance learning. The university offers three military-related minors at the Tampa campus. The sixteen-credit hour Aerospace Studies Minor provides an understanding of military officer management and leadership concepts, as well as an analysis of the evolution of American defense policy and strategy. The eighteen-credit hour Military Science Minor provides students with an in-depth understanding of Army leadership doctrine and a framework for applying such concepts outside of the classroom. The eighteen-credit hour Naval Science and Leadership Minor places special emphasis on character development and effective communication skills, while providing an understanding of the Naval leadership doctrine and the fundamental principles used by leaders in the Navy and Marine Corps. Students enrolled in a USF ROTC program have the opportunity to live in the on-campus ROTC Living Learning Community (LLC). Located in the suite-style Maple Hall, the ROTC LLC allows students to be exposed to the customs of each military branch, while developing camaraderie with their fellow cadets and midshipmen. The USF Student Government, like all Florida student governments, is an agency of the state created under Florida Statute 1004.26. Student Government, made up of 250 student volunteers and employees, is responsible for advocating for students at the university, local, state and national levels. The Student Senate allocates and expends over $17 million in activity and service fees a year by Florida law. The Student Government is set up much like the federal government and is bound by the Student Body Constitution, student government statutes, university regulations, and applicable law. The executive administration oversees several departments and service agencies including SAFE Team, Student Government Computer Services, and Bulls Radio. The Student Body President can also be voted in to sit on the University Board of Trustees and is a member of the Florida Student Association (FSA). The Student Senate, headed by the Senate President and Senate President Pro-Tempore, creates legislation and allocates and expends activity and service fee funds per Florida Statute 1009.24. The senate has 60 seats that are filled by the 14 colleges. Each college is allotted a certain numbers of seats depending on the size of the college. The Senate carries out its duties mostly through committees. The Student Supreme Court, headed by the Chief Justice, hears cases involving students and Student Government and also hears all final parking appeals for students at the USF Tampa campus. Housed in the Student Services building near the center of campus, the University of South Florida Career Services offers support to students and alumni in the process of dreaming, planning, and achieving their career goals. The on-site staff of Career Counselors teach students how to use a strategic approach in planning for a career path and job search. Career Services helps undergraduates self-assess, learn how to conduct career research, seek out experiences that will give you transferable skills, and search for full-time employment or prepare for graduate school. The office also provides similar assistance to graduate students and alumni to break onto the scene in their field of study and assist them in creating a brand for themselves and gain the tools necessary to be a real competitor in the workforce. Career Services is responsible for a host of networking and professional development opportunities on campus, including career fairs, resume workshops, mock interviews with recruiters from local businesses, professional etiquette dinners, and virtual job searching through Employ-A-Bull. USF Career Services also collaborates with several student organizations such as Alpha Kappa Psi Professional Business Fraternity, Delta Epsilon Iota Academic Honor Society, the American Marketing Association as well as the College of Business to hold on-campus events for the student body throughout the academic year. Beginning in 1961, a local afternoon newspaper, The Tampa Times, covered university news in the one-page weekly "Campus Edition." Now defunct, the newspaper was succeeded by The Oracle. First published in 1966, the weekly broadsheet was distributed every Wednesday. Housed today in the Student Services Building of the Tampa campus, the student-run newspaper is published four times a week during the Fall and Spring semesters and twice a week during the Summer semesters. The 12,000 circulation newspaper has been recognized by the Society of Professional Journalists and the Associated Collegiate Press for excellence in journalism. Owned by USF, WUSF (FM) first began airing in 1963. A member station of National Public Radio, the broadcast studio is located on the USF Tampa campus. Currently, the FM station broadcasts NPR and local news during the day and jazz music in the overnight hours. The station is funded by local corporate and private contributors, as well as the Corporation for Public Broadcasting and is affiliated with the Public Broadcasting Service. In 2003, WUSF 89.7 became the first public radio station in the nation to broadcast a digital signal. Today, WUSF Public Media offers local and national news coverage, educational programming, and jazz and classical music through WUSF 89.7, WUSF 89.7², WSMR 89.1, WEDQ, IntellisMedia, and WUSF New Media. The student-run radio station at USF, now known as Bulls Radio, first went on the air in 1988. Formerly known as "WBUL" until 2009, the original station broadcast from the Andros building on the Tampa campus. The station has since moved to the Marshall Student Center, where student reporters and DJs broadcast from a studio featuring a window that overlooks the Beef 'O' Brady's restaurant. Now one of the largest student-run radio stations in the state of Florida, Bulls Radio can be heard on 1620 AM, 88.5 HD2 or online. The university alma mater was composed by USF professor of music Wayne Hugoboom in 1960. The song was the result of a campus competition, for which Hugoboom won the first-place $250 prize. The alma mater was first used in 1961, and can be heard at the opening of every USF Commencement Ceremony. It is also played by the USF Herd of Thunder marching band before every football game. The Golden Brahman March, more commonly known as the USF fight song, is named after the original USF mascot. In 1962, the university chose the mascot the Golden Brahman because of the state's history in cattle-raising. Although the university mascot has since evolved into the Bulls, the fight song name preserves the history of this USF icon. In 2011, the university athletics department launched a campaign to encourage students, faculty, staff, and fans to memorize the song. Today, incoming students are taught the song, along with other USF cheers, during new student and transfer orientation sessions. During the Golden Brahman March and other USF songs, fans will circle the "Go Bulls" hand symbol above their heads. Created with the pointer and pinky finger, the gesture was first used as a good luck symbol during free-throw shots at USF basketball games. Today, it is used as a greeting and cheering symbol by USF students and alumni. Often confused by many as the USF fight song, "The Bull" is a rally cry played by the USF Herd of Thunder marching band that encourages fans to stand up and circle the "Go Bulls" hand symbol above their heads. USF competed in its first intercollegiate athletic event in 1965, when it defeated the Florida Southern College men's soccer team. The university was admitted into the NCAA in 1968, and currently competes at the NCAA Division I level. USF was a charter member of the Sun Belt Conference, joined Conference USA in 1995, was admitted into the Big East Conference in 2003, and is currently a member of the American Athletic Conference. There are nearly 500 student-athletes competing for the university each academic year. Lee Roy Selmon Athletic Center. Located on the Tampa campus, the USF Athletic District is the home for Bulls intercollegiate sports. The district includes the Lee Roy Selmon Athletic Center, the Corbett Soccer Stadium, the Frank Morsani Football Practice Complex, the Pam & Les Muma Basketball Practice Center, the USF Sun Dome, The Claw, the USF Baseball Stadium, the USF Softball Stadium, the USF Track & Field Stadium, and the USF Varsity Tennis Courts. Opened in 2004, the Lee Roy Selmon Athletic Center is the main hub for USF Athletics. In 2012, the facility was dedicated to the late Lee Roy Selmon, a Pro Football Hall of Fame member, former Director of USF Athletics, and the "Father of USF Football.". The 104,000 square foot facility houses all USF sports teams, except for men's and women's basketball, sailing, and volleyball. The building features include a large strength and conditioning center, and a sports medicine clinic. The USF Sun Dome on the Tampa campus is the home facility of the men's and women's basketball teams and the women's volleyball team. The first event held in the facility was a basketball game in 1980. The arena has been the site for other major university events, and a number of outside events, including sports, concerts, and other entertainment events. The USF football team plays at Raymond James Stadium, home to the professional football team the Tampa Bay Buccaneers, making USF one of only a few American college teams to play in an NFL stadium. Located ten miles away from the USF Tampa campus, the stadium has a capacity of more than 65,000 people. USF Herd of Thunder Marching Band at the Sun Bowl. The USF Spirit Squads — consisting of the USF Sun Dolls, USF Cheerleading, Rocky the Bull, the USF Herd of Thunder — play an integral role in USF Athletics. In addition to supporting USF varsity athletic teams during sporting events, the spirit squads themselves compete at the national level. Rocky the Bull first began as a toy idea for the USF Bookstore in 1965. Today's Rocky was unveiled in 2003. As the official mascot for USF, Rocky the Bull can be seen at USF Athletic events, as well as other major university and community events. The USF Herd of Thunder consists of several bands, including a 370-member marching band, pep band, show band, and winter guard. The marching band performs at all home USF football games. The pep band, called the Herd of Thunder Rumble Pep Band, performs at all home USF basketball games. The show band is a 30-piece group that performs at select events that are unable to accommodate the full marching band. ^ "SURA Member Universities". SURA – The Science of Collaborative Research. Retrieved August 5, 2015. ^ USF Color Palettes | University Communications. Retrieved October 26, 2018. ^ "UCF System Facts 2014–2015" (PDF). University of South Florida. Retrieved August 5, 2015. ^ a b c d "About USF Overview". usf.edu. University of South Florida. Retrieved June 18, 2013. ^ a b "Academics Overview". usf.edu. University of South Florida. Retrieved June 20, 2013. ^ a b c d e f g h i j k "Points of Pride". usf.edu. University of South Florida. Retrieved June 18, 2013. ^ a b "USF Facts and Statistics". usf.edu. University of South Florida. Retrieved June 18, 2013. ^ "General Information Blurb". University of South Florida – Research and Innovation. Archived from the original on July 3, 2015. Retrieved August 6, 2015. ^ a b c d e f g h i j k l m n o p q r s t u v w x y z aa ab ac "USF History". usf.edu. University of South Florida. Retrieved June 20, 2013. ^ ""Father of USF" Samuel Gibbons Dies". usf.edu. University of South Florida. Retrieved June 20, 2013. ^ a b c d e f "Rocky and the Bulls". USF Alumni. USF Alumni Association. Retrieved June 20, 2013. ^ "'Build Us A University'—And That's What Dr. John Stuart Allen Did," St. Petersburg Times, pp. 1D & 5D (April 26, 1970). Retrieved March 5, 2010. ^ "Five Building Name Changes". usf.edu. University of South Florida. Retrieved June 20, 2013. ^ a b c "Cecil Mackey oral history interview". USF Scholar Commons. USF Library. Retrieved June 20, 2013. ^ "Honorary Committee Biographies". Archived from the original on March 14, 2007. Retrieved September 8, 2006. ^ "Francis Borkowski oral history interview". USF Scholar Commons. USF Library. Retrieved June 20, 2013. ^ Colavecchio-Van Sickler, Shannon (December 19, 2006). "Betty Castor Returning to USF". Tampa Bay Times. Retrieved June 20, 2013. ^ Danielson, Richard (June 30, 2009). "Betty Castor leaves top job at Dr. Kiran C. Patel Center for Global Solutions at USF". Tampa Bay Times. Archived from the original on March 1, 2014. Retrieved August 2, 2013. ^ "Office of the Presidente". usf.edu. University of South Florida. Retrieved June 21, 2013. ^ Florida, University of South. "USF Officially Designated as "Preeminent" by the Florida Board of Governors – University of South Florida". news.usf.edu. Retrieved August 13, 2018. ^ a b c "USF System". usf.edu. University of South Florida. Retrieved June 25, 2013. ^ Partington, Karie (August 20, 2007). "FGCU past: Era ends as USF closes the doors to its Fort Myers branch". Naples Daily News. Retrieved June 25, 2013. ^ "Florida Polytechnic University". State University System of Florida. Board of Governors. Archived from the original on September 5, 2013. Retrieved June 25, 2013. ^ "State University System of Florida". flbog.org. Florida Board of Governors. Archived from the original on March 29, 2013. Retrieved March 30, 2013. ^ "University Board of Trustees". flbog.edu. Florida Board of Governors. Archived from the original on September 5, 2013. Retrieved July 31, 2013. ^ "Genshaft Announces USF Reaches the Benchmarks for "Preeminence" - University of South Florida". news.usf.edu. Retrieved March 12, 2019. ^ Schreiner, Mark. "Breaking Down What USF's Preeminence Means". wusfnews.wusf.usf.edu. Retrieved March 12, 2019. ^ a b c d e f g h i j "USF System Facts 2014–2015" (PDF). University of South Florida. Retrieved August 6, 2015. ^ Florida, University of South. "Tobacco Free Campus | USF". www.usf.edu. Retrieved April 16, 2018. ^ "University of South Florida St. Petersburg". usf.edu. ^ "2007 Quick Facts USF Sarasota-Manatee". Archived from the original on July 1, 2007. Retrieved July 16, 2007. ^ "About the new USF Sarasota-Manatee campus". usf.edu. Archived from the original on July 15, 2007. Retrieved February 10, 2017. ^ "USF Sarasota-Manatee Quick Facts". sarasota.usf.edu. University of South Florida. Retrieved June 26, 2013. ^ a b c d "Academic Calendars". usf.edu. USF Office of the Registrar. Retrieved June 27, 2013. ^ "USF Facts". usf.edu. University of South Florida. Retrieved June 27, 2013. ^ "Academic Ranking of World Universities 2017". Academic Ranking of World Universities. Retrieved September 16, 2017. ^ "University of South Florida". U.S. News & World Report. Retrieved September 10, 2018. ^ "2015 National Universities Rankings". Washington Monthly. Retrieved March 28, 2016. ^ "Academic Ranking of World Universities 2015". Academic Ranking of World Universities. Retrieved March 28, 2016. ^ "University of South Florida". QS Top Universities. Retrieved March 28, 2016. ^ "Times Higher Education World University Rankings". Times Higher Education. Retrieved March 28, 2016. ^ "Academics". Retrieved August 6, 2018. ^ "Autar Kaw". U.S. Professors of the Year Awards Program. Retrieved June 16, 2018. ^ a b "Commencement History". usf.edu. University of South Florida. Retrieved June 28, 2013. ^ a b c d "Commencement Ceremony Information". usf.edu. University of South florida. Retrieved June 28, 2013. ^ a b "Libraries". usf.edu. University of South Florida. Retrieved June 28, 2013. ^ "Special Collections at the USF Library". lib.usf.edu. USF Libraries. Retrieved July 1, 2013. ^ "USF Smart Lab". lib.usf.edu. USF Libraries. Retrieved July 1, 2013. ^ "USF to restore library hours after student protest". Tampa Bay Times. ^ a b c d "Other USF Libraries". lib.usf.edu. USF Libraries. Retrieved June 28, 2013. ^ "USF Research Overview". usf.edu. University of South Florida. Retrieved July 1, 2013. ^ "About USF Health". health.usf.edu. USF Health. Retrieved June 27, 2013. ^ "USF Health Office of Research". health.usf.edu. USF Health. Retrieved July 1, 2013. ^ "Doctors of USF Health". health.usf.edu. USF Health. Retrieved July 1, 2013. ^ a b "CAMLS Opening". health.usf.edu. USF Health. Retrieved July 1, 2013. ^ a b c "Office of Sustainability Academics". Patel College of Global Sustainability. Patel College of Global Sustainability. Retrieved July 22, 2013. ^ "University of South Florida Climate Action Plan". American College and University Presidents Climate Commitment. Archived from the original on October 29, 2013. Retrieved March 4, 2013. ^ "Progress Report for the University of South Florida". American Colleges and University President's Climate Commitment. Second Nature ACUPCC Reporting System. Archived from the original on October 29, 2013. Retrieved March 4, 2013. ^ "USF Office of Sustainability Initiatives". USF Office of Sustainability. USF Office of Sustainability. Retrieved July 22, 2013. ^ "Student Green Energy Fund". USF Office of Sustainability. USF Office of Sustainability. Retrieved July 22, 2013. ^ "Student Affairs Departments". sa.usf.edu. USF Student Affairs. Archived from the original on July 19, 2013. Retrieved July 23, 2013. ^ a b c d e f g h "History of the MSC". msc.usf.edu. USF Marshall Student Center. Archived from the original on June 2, 2013. Retrieved July 30, 2013. ^ "Marshall Student Center Construction Project". msc.usf.edu. USF Marshall Student Center. Archived from the original on October 1, 2013. Retrieved July 30, 2013. ^ "Retail". msc.usf.edu. USF Marshall Student Center. Archived from the original on June 4, 2013. Retrieved July 30, 2013. ^ "Food/Dining". msc.usf.edu. USF Marshall Student Center. Archived from the original on April 5, 2013. Retrieved July 30, 2013. ^ "Building Map". msc.usf.edu. USF Marshall Student Center. Archived from the original on May 31, 2013. Retrieved July 30, 2013. ^ a b c d "Housing Options". housing.usf.edu. USF Housing and Residential Education. Retrieved July 26, 2013. ^ a b c "First-Year Students". housing.usf.edu. USF Housing and Residential Education. Archived from the original on July 19, 2013. Retrieved July 26, 2013. ^ a b c "Living Learning Communities". housing.usf.edu. USF Housing and Residential Education. Archived from the original on July 19, 2013. Retrieved July 30, 2013. ^ a b c "Affiliated Properties". housing.usf.edu. USF Housing and Residential Education. Archived from the original on August 3, 2013. Retrieved July 26, 2013. ^ "Campus Rec Center Renovation". news.usf.edu. USF News. Retrieved July 26, 2013. ^ "Fitness". usf.edu/campusrec. USF Campus Recreation. Retrieved July 26, 2013. ^ "Satellite Fitness Centers". usf.edu/campusrec. USF Campus Recreation Center. Retrieved July 26, 2013. ^ "Intramurals". usf.edu/campusrec. USF Campus Recreation. Retrieved July 30, 2013. ^ a b c d e "Riverfront Park". usf.edu/campusrec. USF Campus Recreation. Retrieved July 29, 2013. ^ a b c d "Adventure Trips". usf.edu/campusrec. USF Campus Recreation. Retrieved July 29, 2013. ^ a b c "Student Organizations". involvement.usf.edu. Center for Student Involvement. Retrieved July 22, 2013. ^ "Center for Leadership and Civic Engagement". University of South Florida Student Affairs. Retrieved November 1, 2015. ^ a b "Governing Councils". Fraternity and Sorority Life. USF Office of Fraternity and Sorority Life. Archived from the original on December 12, 2013. Retrieved July 22, 2013. ^ "Greek Village". Housing Options. USF Housing & Residential Education. Retrieved July 22, 2013. ^ a b c d e "ROTC". ugs.usf.edu. USF Undergraduate Studies. Retrieved July 30, 2013. ^ a b c d "C.W. Bill Young Hall". USF Air Force ROTC. Archived from the original on March 24, 2014. Retrieved July 30, 2013. ^ a b "ROTC LLC". housing.usf.edu. USF Housing and Residential Education. Archived from the original on August 22, 2013. Retrieved July 30, 2013. ^ a b c d e f g h i "About Student Government". sg.usf.edu. USF Student Government. Retrieved July 23, 2013. ^ "Career Services Homepage". www.usf.edu/career-services/. USF Career Services. Retrieved February 4, 2014. ^ "Career Services Events Page". USF Career Services. Retrieved February 4, 2014. ^ "Delta Epsilon Iota at USF". usf-dei.org/. USF Delta Epsilon Iota Academic Honor Society Phi Iota Chapter. Archived from the original on February 21, 2014. Retrieved February 4, 2014. ^ "USF College of Business Student Organizations". usf.edu. USF College of Business. Retrieved February 4, 2014. ^ "USF AMA". USF American Marketing Association. Retrieved February 4, 2014. ^ a b c d e "About The Oracle". usforacle.com. USF Oracle. Retrieved July 30, 2013. ^ a b c "About WUSF". wusf.org. WUSF. Retrieved July 30, 2013. ^ a b "WUSF – A History". radioyears.com. Radio Years. Retrieved July 31, 2013. ^ a b c d "About Us". bullsradio.org. Bulls Radio. Archived from the original on September 5, 2013. Retrieved July 30, 2013. ^ a b c d e "USF Songs & Ringtones". usfalumni.org. USF Alumni Association. Retrieved July 31, 2013. ^ "USF Athletics Encourages You to Learn the USF Fight Song". news.usf.edu. University of South Florida. Retrieved July 31, 2013. ^ a b "Traditions". usf.edu. University of South Florida. Retrieved July 31, 2013. ^ Burke, Kevin. "Student-Athlete Success Soars". news.usf.edu. University of South Florida. Retrieved August 1, 2013. ^ a b c "Athletic Facilities". gousfbulls.com. USF Athletics. Retrieved August 1, 2013. ^ a b c "Lee Roy Selmon Athletics Center". gousfbulls.com. USF Athletics. Retrieved August 1, 2013. ^ "USF Names Building Lee Roy Selmon Athletics Center". gousfbulls.com. USF Athletics. Retrieved August 1, 2013. ^ "Sun Dome". gousfbulls.com. USF Athletics. Retrieved August 1, 2013. ^ Louk, Jim. "Goodbye from an old friend". gousfbulls.com. USF Athletics. Retrieved August 1, 2013. ^ a b "About the Stadium". raymondjamesstadium.com. Tampa Sports Authority. Archived from the original on July 30, 2013. Retrieved August 1, 2013. ^ a b c "USF Spirit Squads". gousfbulls.com. USF Athletics. Retrieved August 1, 2013. ^ a b c d "About". herdofthunder.usf.edu. USF Herd of Thunder. Retrieved August 1, 2013. ^ a b c d e f "Note-A-Bulls". usfalumni.org. USF Alumni Association. Retrieved August 1, 2013.